Stunning view of the house in winter. Welcome to our website which details our rental property in France. 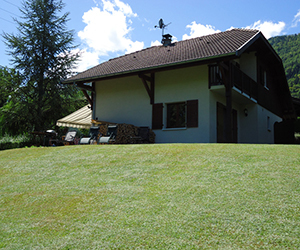 The property is a detached two-storey three-bedroom house built in the Savoyard style, common to the local area. It is located at the end of a quiet cul-de-sac in the village of Lathuile. It is available for rental all year round, but of course the most popular time of the year tends to be July and August due to the school holidays and the best of the summer weather. There is literally an unlimited variety of activities to do in this beautiful area of France. Please see the “Activities” page for a feel of what some of the more popular activities are. The location is also ideal if you are looking for a peaceful and relaxing time as it is well away from any main roads. In the summer, just lie on a sun lounger and enjoy the relaxing views of the mountains……or cosy up around a roaring log fire in the winter, well away from any busy ski villages. If you want to ski, then there is a great variety of quality ski resorts. The nearest is only 20 minutes away and ski costs are remarkably low at local resorts. The big resorts, such as the Trois Vallées and similar, are approximately 1 hr 15 min drive away. They offer a great variety of pistes but have a price to match. Within about one hour, there is a great variety of excellent resorts at medium prices. Please browse the website to get a feel of the house and the local area. We will be happy to forward availability and price details.